A pictorial review of a WWII RAAF heavy bomber base which became the main aircraft storage and disposal site. 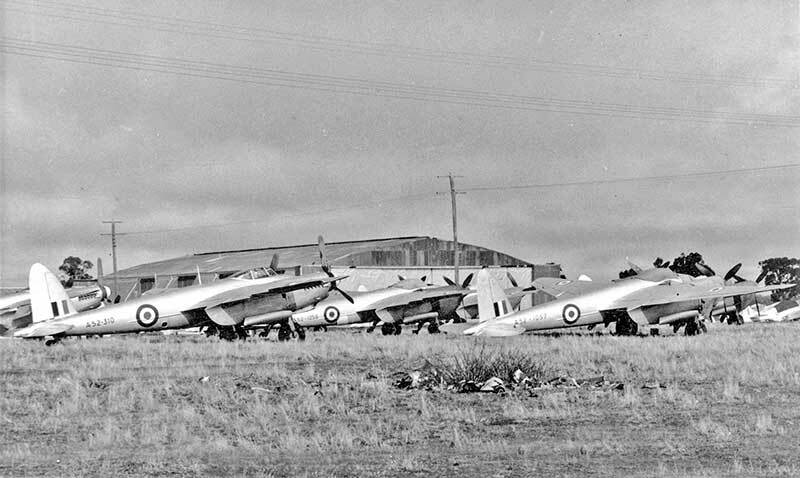 RAAF DH Mosquitos retired at RAAF Tocumwal circa 1956, parked in the open pending sale to scrap metal merchants. Tocumwal is a small town among river gums on the NSW side of the River Murray, 270 Km north of Melbourne. In the paddle steamer transport days along the river, it became a commercial centre, with a NSW State Government railway line to Sydney and a Victorian Government line to Melbourne, although with different gauge tracks. 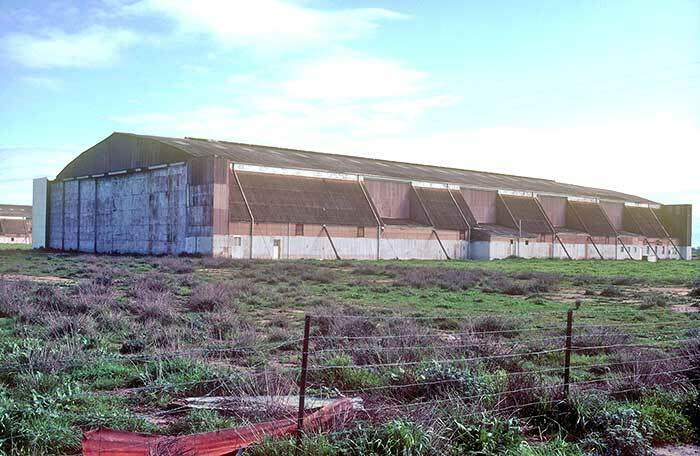 During World War II a large military airfield was constructed on the edge of the town, and after the war this airfield with its large hangars became the RAAF's main aircraft storage and disposal base. 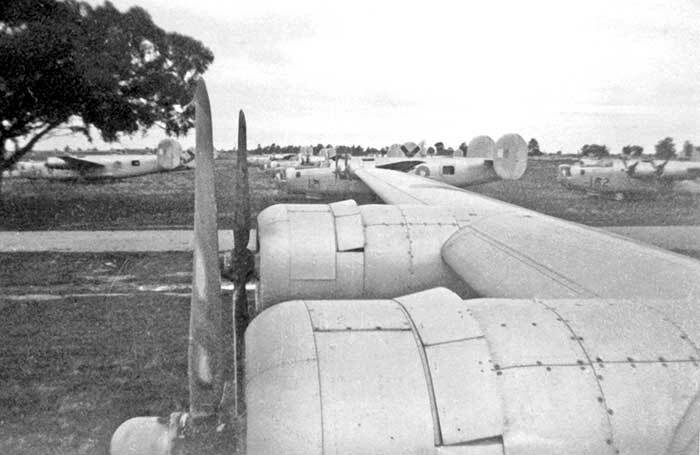 Many hundreds of Australian military aircraft made their last flights being ferried to Tocumwal, where they were sold to scrap metal dealers and melted down to ingots in smelters set up on the airfield. In early 1942 with Japanese forces building up in New Guinea and air raids on northern Australian towns, invasion of Australia from the north seemed inevitable. The US 5th Air Force, as part of the Allied defence, hastily commenced establishing airfields and facilities in Australia and New Guinea. A heavy bomber base was needed in Australia to provide a full range of maintenance and operational support that was safe from enemy attack. 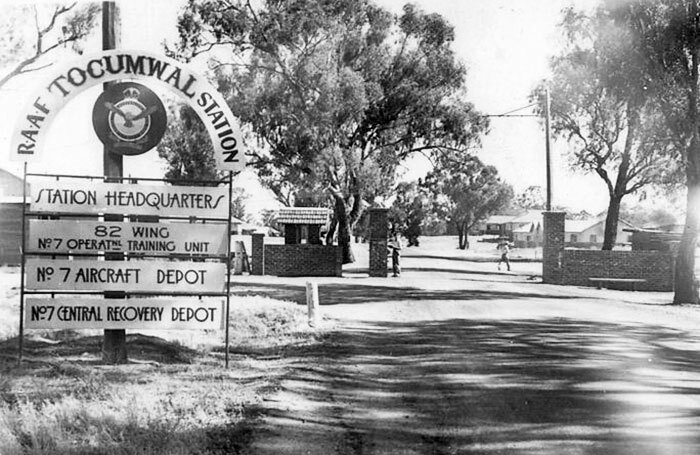 A location well south of the anticipated enemy invasion area (the infamous "Brisbane Line") was required and Tocumwal was selected to take advantage of its wide open flat landscape and railway connections to bring equipment and personnel from the seaports at Sydney and Melbourne. After only a few months use by USAAF, the war sitation had changed, easing the threat of Australian attack from the north. General George C.Kenney, Commander Allied Air Forces SWPA is reputed to have said when inspecting Tocumwal "Mighty fine base - now shift it 2,000 miles closer to the enemy". 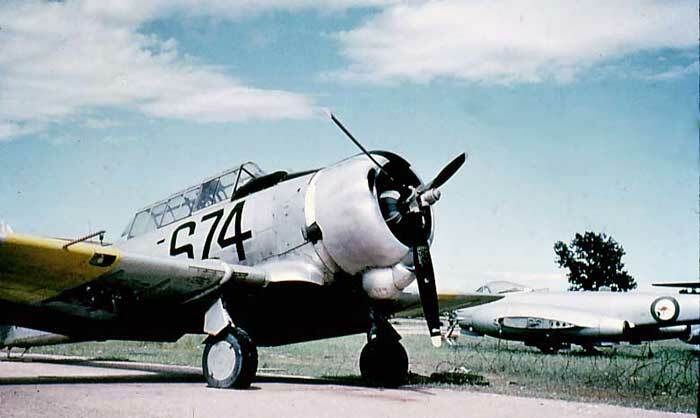 The US facilities of Tocumwal were now established at Garbutt Field, Townsville, north Queensland where the airfield rapidly expanded to provide Allied aircraft maintenance, operations and air transport between Australia and New Guinea. 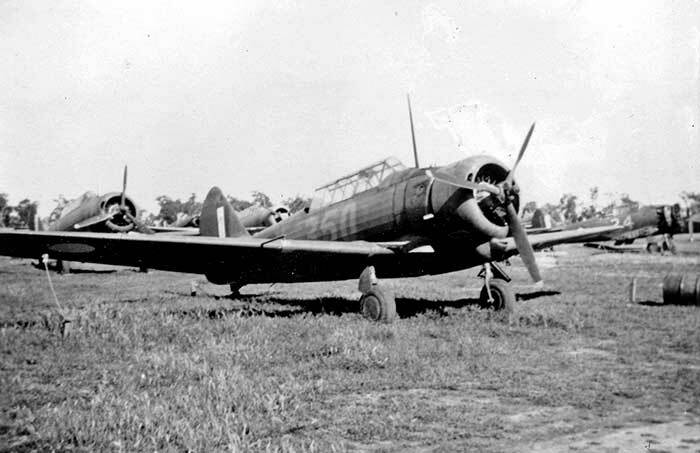 In November 1942 McIntyre Field was handed over to the Australian Government and renamed RAAF Station Tocumwal. 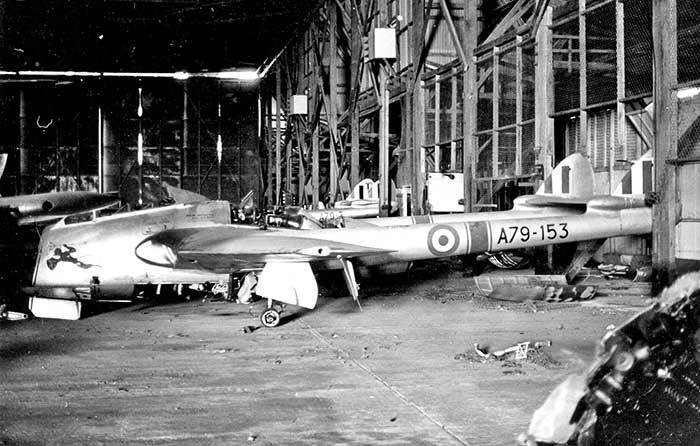 The initial unit was No.7 Aircraft Depot to provide airframe and engine maintenance for a variety of RAAF aircraft types and aircraft storage while between operational units. 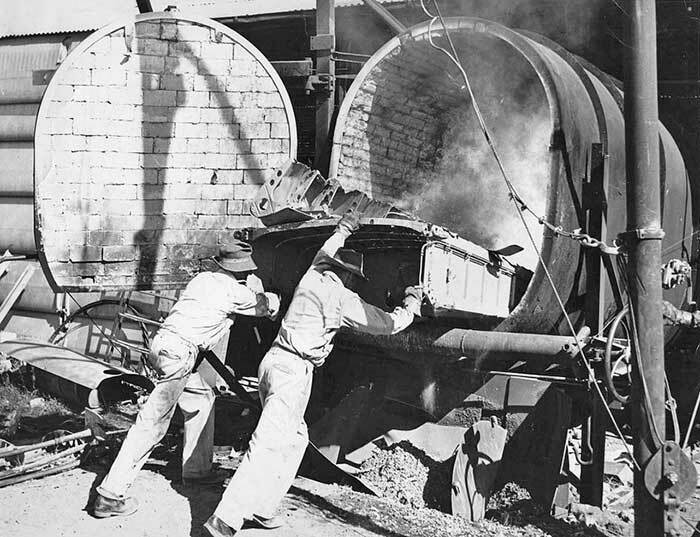 No.7 Central Recovery Depot commenced at Tocumwal in June 1943 tasked with collecting damaged aircraft and salvaging usable parts. 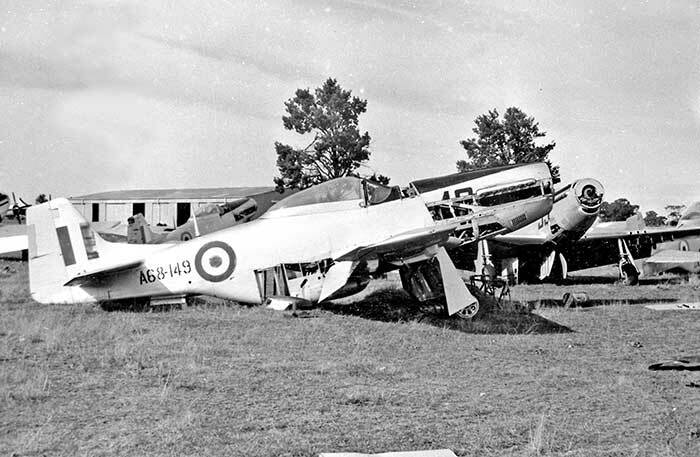 An indication of 7CRD's work is a report that between April-September 1945, the unit converted to parts and scrap a total 54 aircraft includings Anson, Liberator, Boomerang, Oxford types. 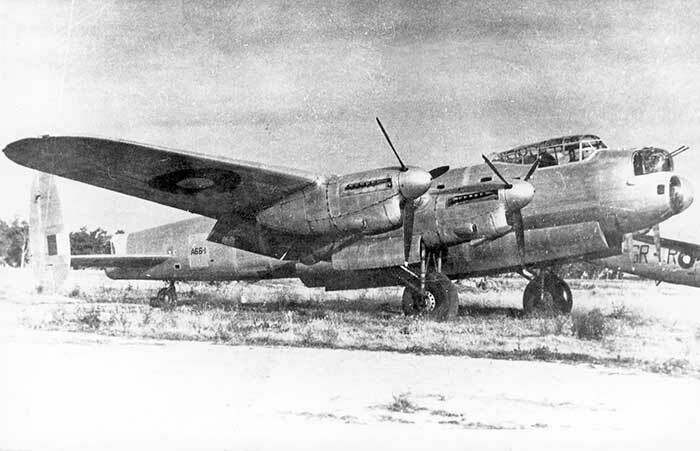 No.5 Operational Training Unit moved from Wagga to Tocumwal in October 1943 with Beauforts, Beaufighters, Bostons and Mosquitos, later moving to Williamtown. 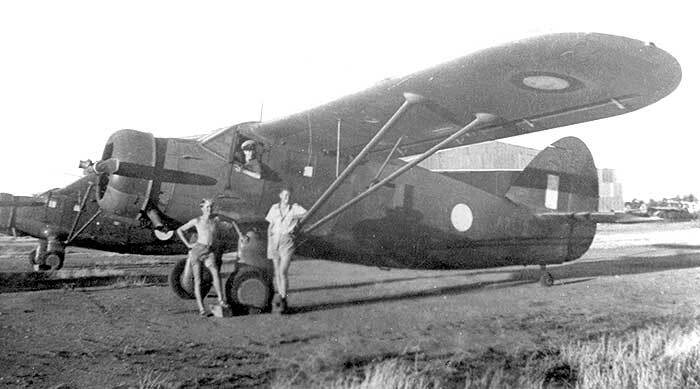 However wartime Tocumwal will always be associated with RAAF B-24 Liberators. 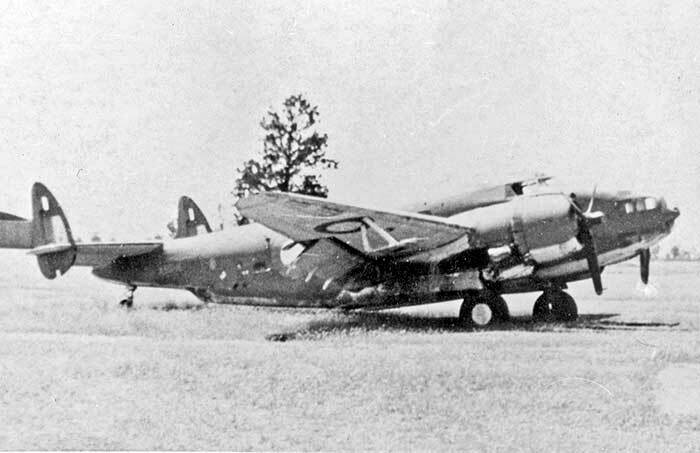 No.7 OTU was established there in February 1944 for B-24 crew training. 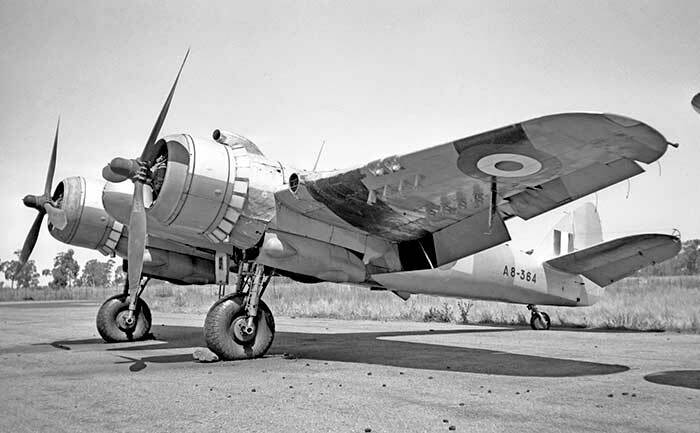 7OTU grew to be equipped with over 50 Liberators and was training 28 Australian B-24 crews each month. 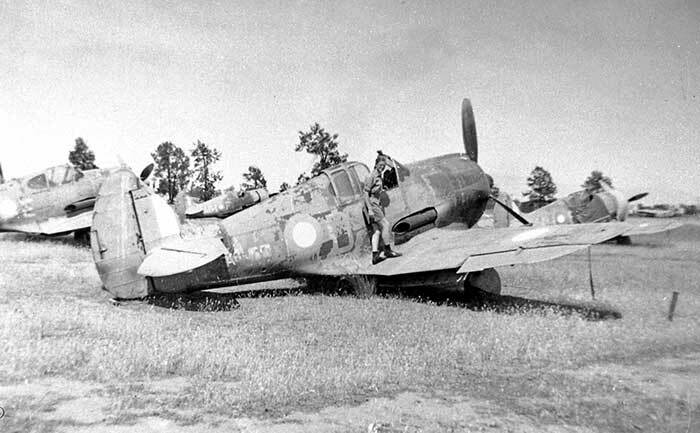 Following the end of WWII, RAAF operations were rapidly reduced. 7OTU and 7CRD were disbanded and 7AD's facilities were taaen over by Care & Maintenance Unit Tocumwal. In 1949 CMU Tocumwal's role was taken over by 1AD Laverton which stationed staff at Tocumwal. This sole surviving Tocumwal unit was referred as 1AD Detachment B. 200 base houses were moved to Canberra during 1946 to help a postwar housing shortage. Postwar the wide expanses of hard standing were used to park large numbers retired RAAF aircraft pending disposals. The large hangars were used for under-cover storage of aircraft that may be recalled to service, also to hold the higher sales value of disposals aircraft which had recently had major overhauls and were in good condition. 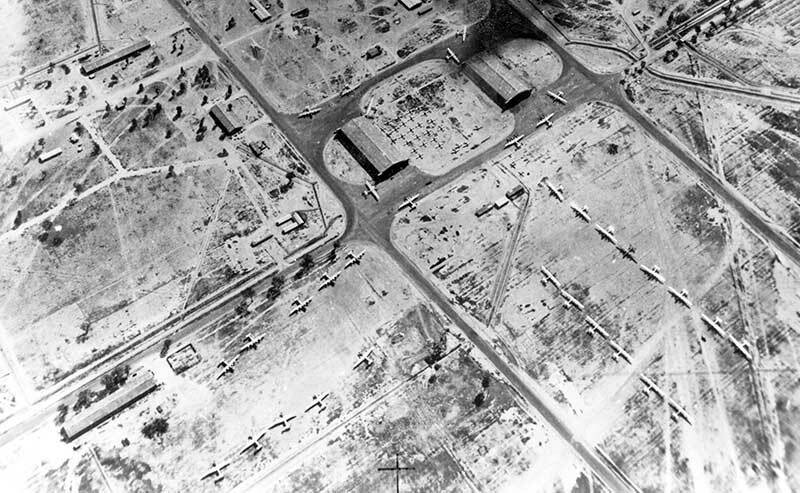 Tocumwal's new role was aircraft storage and disposal to civilian purchasers or scrap metal merchants. Flying operations were now reduced to the arrival of retired military aircraft being ferried in for storage. 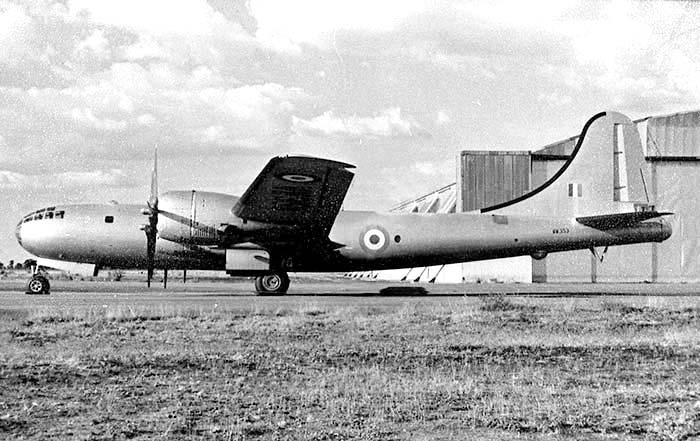 As large scale auctions of unwanted aircraft were held by the post-war Commonwealth Disposals Commission, civilian aircraft began arriving with prospective purchasers to inspect the aircraft or prepare them to be flown out for their new civil careers. 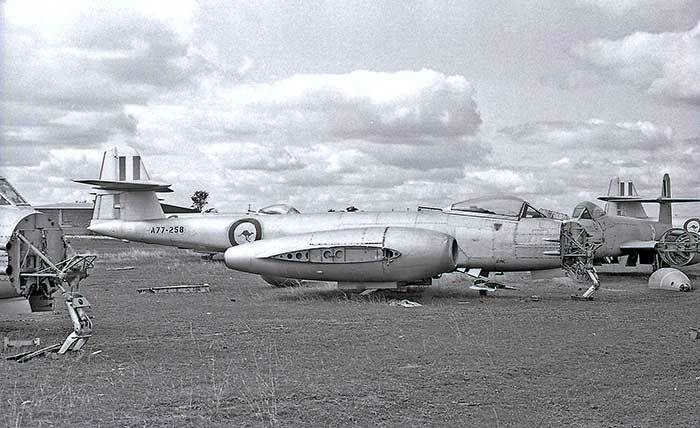 Melbourne scrap dealer R.H.Grant Trading Co was the successful bidder for early batches of aircraft with no civil application and established a metal smelter on the airfield. 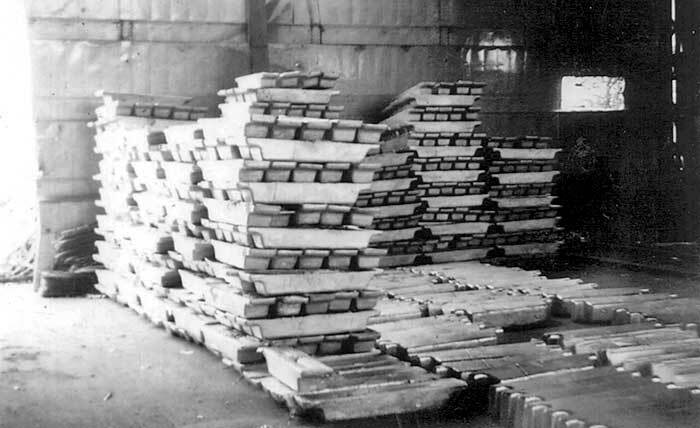 Grants continued scrapping operations at Tocumwal until 1963 when the last Meteors, Vampires and Mustangs were melted down to ingots. 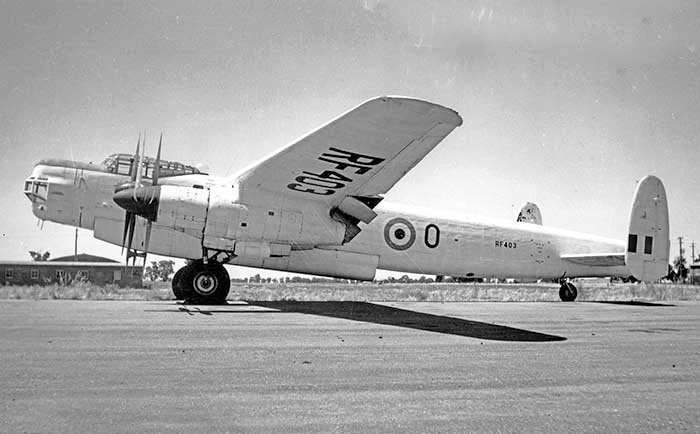 The final RAAF unit, 1AD Detachment B was disbanded on 14 October 1960 and the airfield handed over to the Deparment of Civil Aviation. 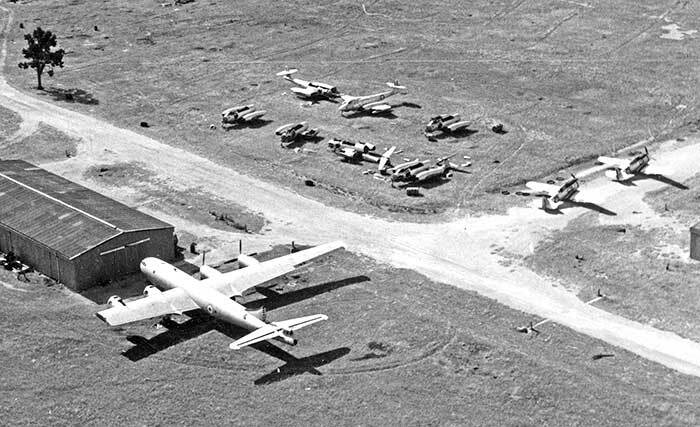 As a civil airfield it became a thriving gliding centre. 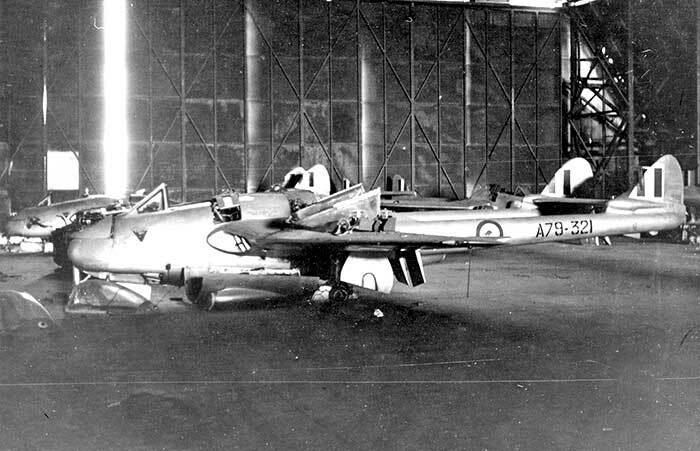 The row of four large wooden wartime Liberator hangars gave been used for storage, including wheat and grain stocks and later a dozen Singapore Air Force Hawker Hunters acquired by an Australian dealer. Liberators are parked at various dispersal areas. 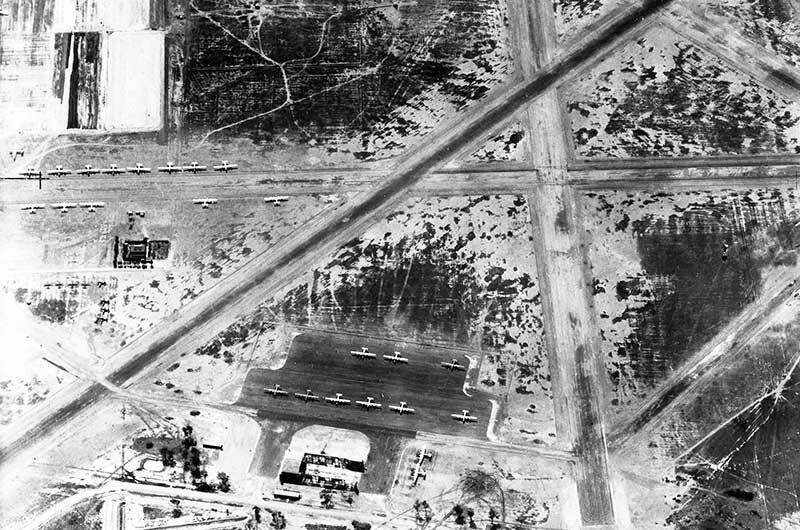 Main gate RAAF Tocumwal 1945 while No.7 Operational Training Unit was conducting B-24 crew training. 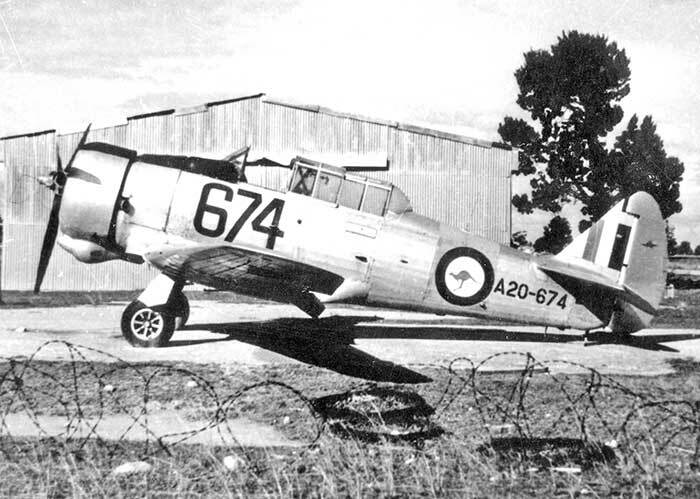 Some RAAF types ferried into Tocumwal were resold on the civil market, such the Noorduyn Norsemans. 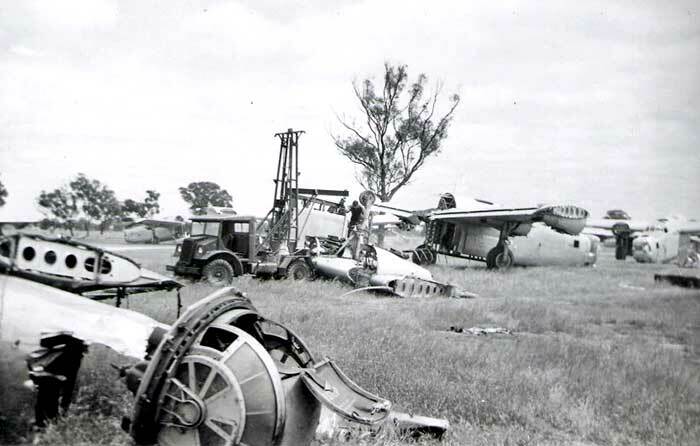 RAAF Liberators dismantled for scrapping circa 1950. 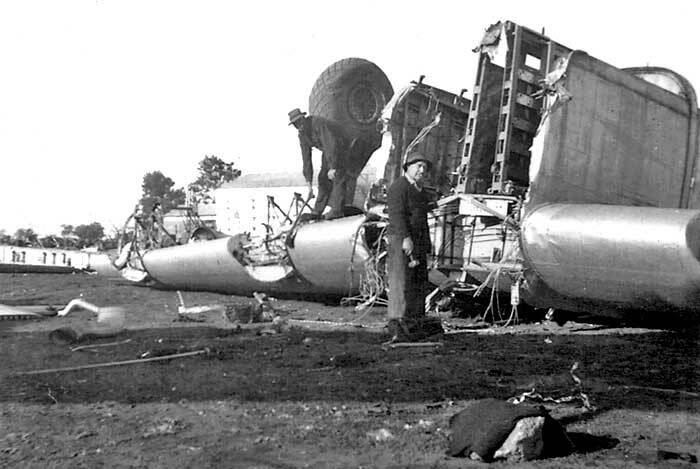 Thanks to Bob Livingstone for this and the following 5 pictures of large scale B-24 scrapping at Tocumwal. 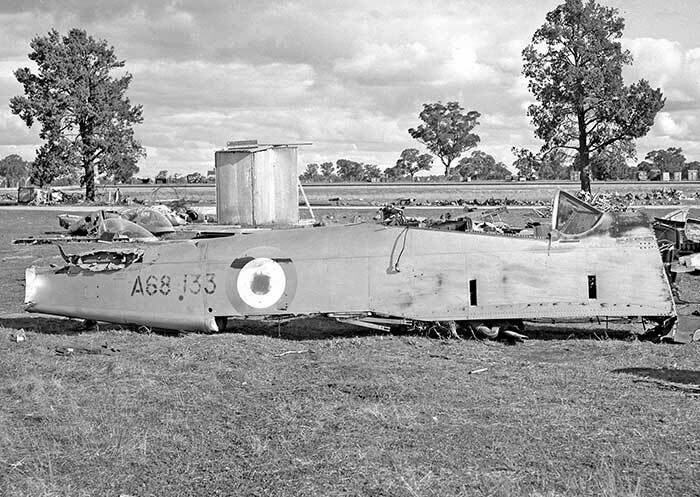 A8-384 was with the last of the RAAF's Bristol Beaufighter target tugs retired at Tocumwal in 1957. 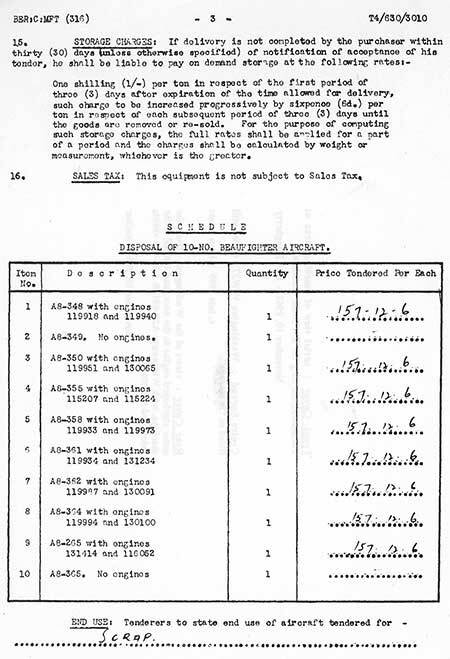 A page from R.H.Grant Trading Company's successful tender for the last ten Beaufighters in February 1957.
outer positions was used by RAAF for trials at Woomera before being retired to Tocumwal in 1956. 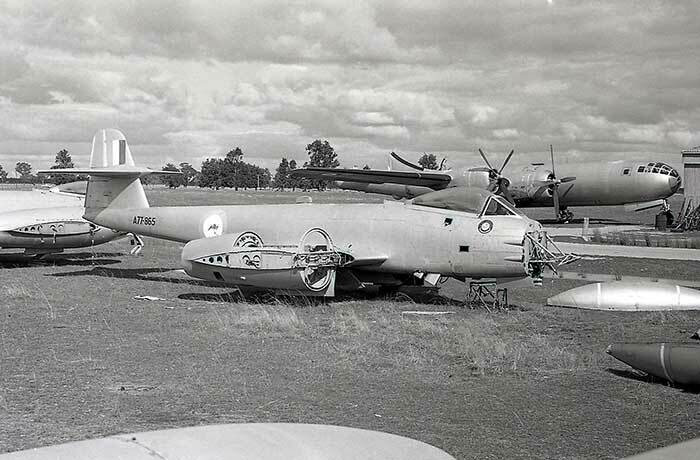 Two RAF Boeing B-29 Washingtons were transferred to RAAF at Woomera for high level bombing trials. 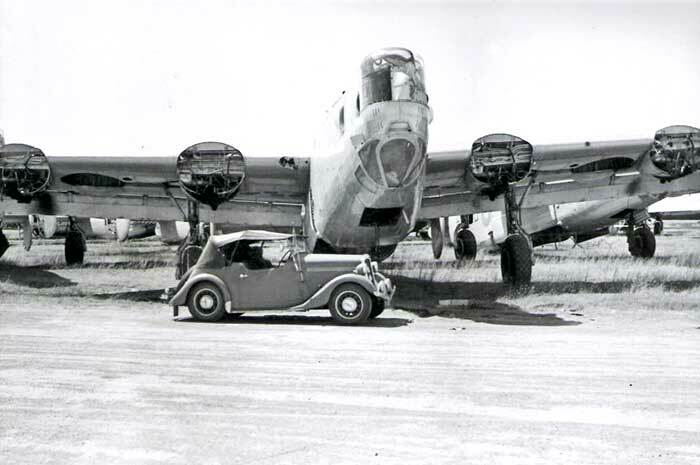 WW353 seen retired at Tocumwal in 1956 in front of one of the large American-built bomber hangars. Large numbers of RAAF Gloster Meteors met their end at Tocumwal. 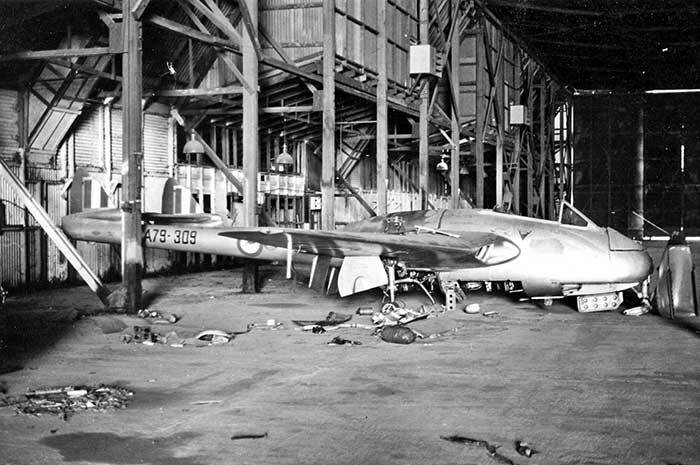 were inside one of the wartime hangars being stripped of reusable parts prior to being scrapped. These three photos are a selection of those he took that day. 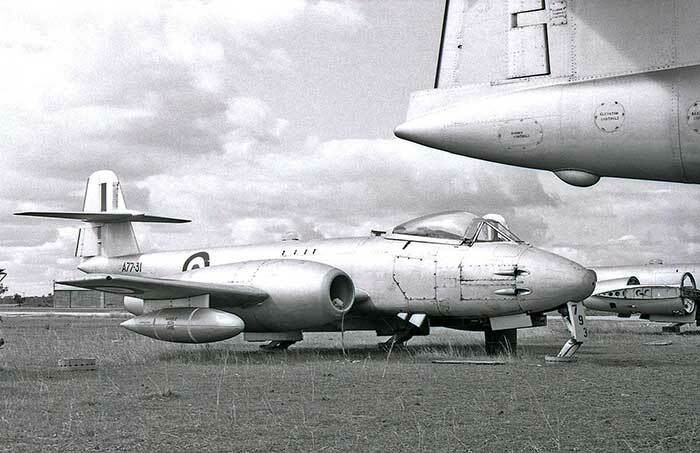 Vampire Mk.30 A79-321 had the new RAAF kangaroo roundels. 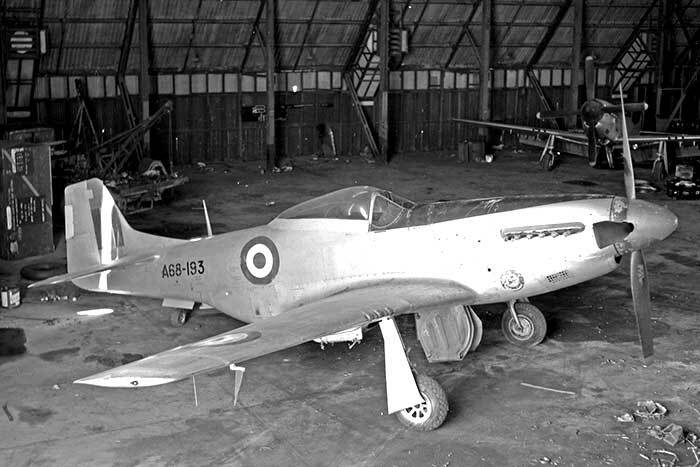 Vampire Mk.30 A79-153 had 2OCU red devil motif on the nose, red wingtips and red bands around booms. Metal dealers R.H.Grant Trading Co retained a few intact Wirraways because of enquiries from civilian buyers. 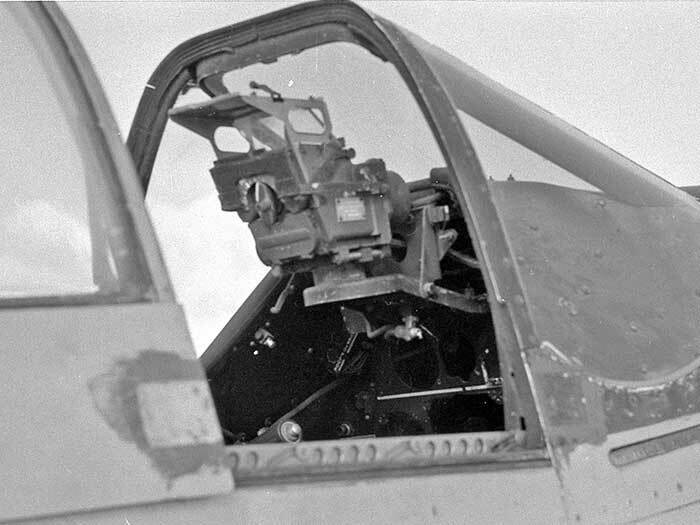 Cockpit of A68-147. 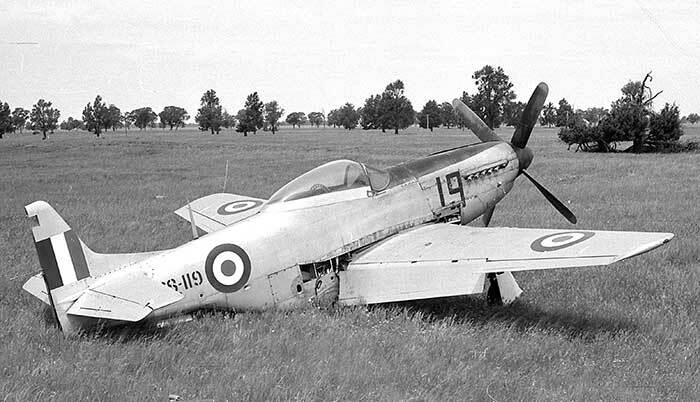 Mustangs were received by R.H.Grant for scrapping complete with cockit equipment. 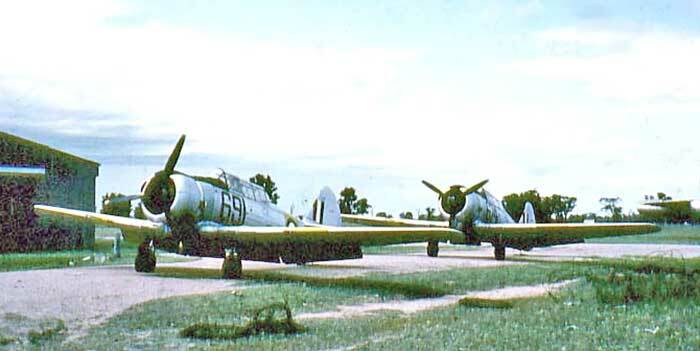 R.H.Grant Trading Co also retained some Mustangs for potential sales as complete aircraft. 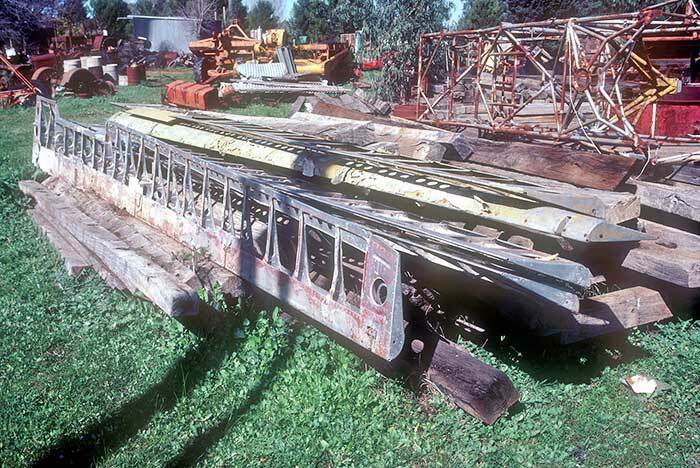 A collection of airframe sections at a Tocumwal farm, salvaged from wartime rubbish dumps on the airfield. 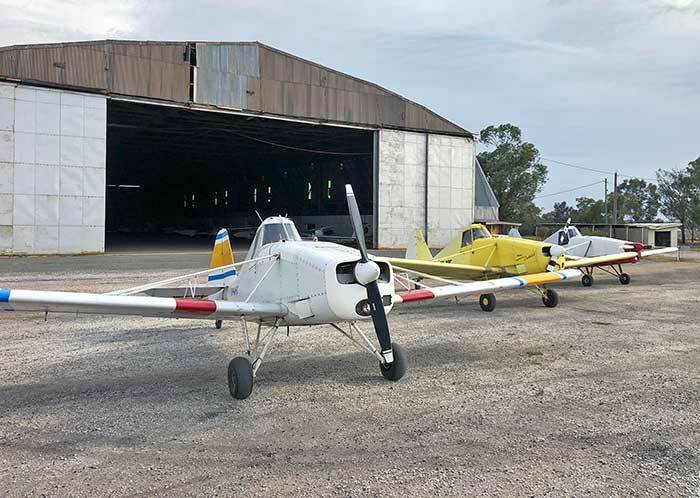 Three CallAir glider tugs outside one of the 1942 American-built bomber hangars still being used in 2019.